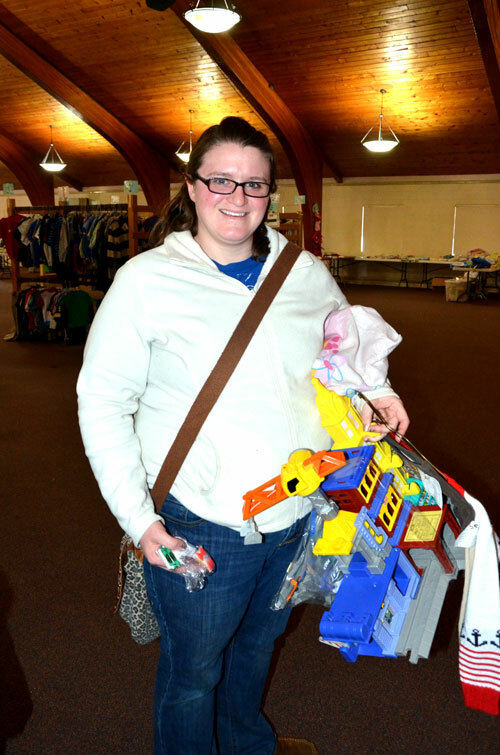 Kim Call of Winona Lake shops for her 8 month old and 4 year old at the Kids Market sale. 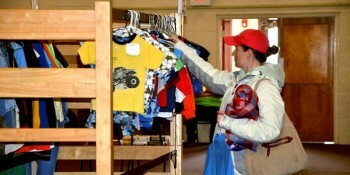 Yesterday afternoon Kids Market Inc. hosted its semi-annual sale on at Rodeheaver Auditorium in Winona Lake. Throngs of people attended the event, which sold over 11,000 items in its first day. Items sold included children’s clothing, toys, nursery items and maternity clothing. 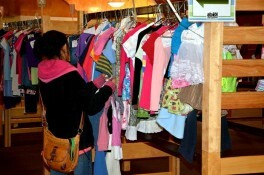 Kids Market is a non-profit organization that hosts two sales aimed toward women and children each year. The sales began in 2001 and due to the success of the event, grew from one sale a year to two. Consigners drop off items to sale and receive 66 percent of the sale price. The remainder of the sale is utilized for the organization’s operating costs and then to Project Independence, Beaman Home, Heartline, Lakeland Youth Center, New Beginnings Preschool, North Webster Community Center, Baker Youth Club, Teen Parents Succeeding, Fellowship Missions, Little Lambs Preschool and Joe’s Kids. Last year’s event brought the total donated to $189,000. According to event coordinator Joye Andrew the organization hopes to reach the $200,000 mark this year. In addition, this year a total of 540 pounds of clothing and nursery items were donated to area children’s charities. Kids Market noted the organization experiences many unforgettable moments throughout the sale weekend. Families that the organization has adopted get the chance to come and pick out clothing for free. Area organizations come to collect multiple boxes of donated items. The organization hears stories about how this sale has helped the women and children that live in the community. The hard work has been paid when the organization meets with the local non-profits to make the financial donations to their organizations and gets to see firsthand how much the sale impacts moms and their children.